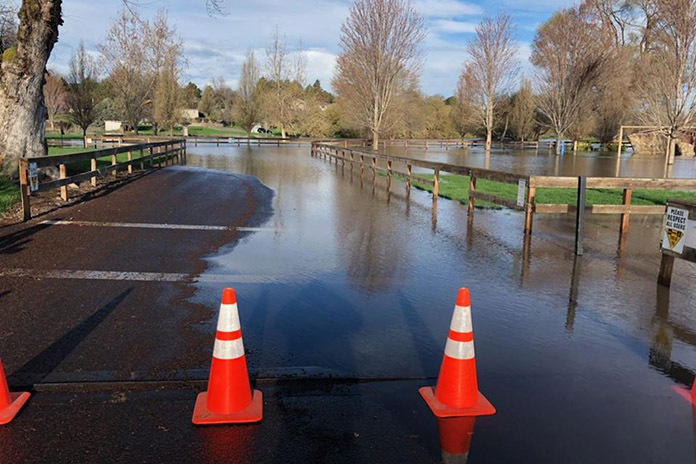 The Umatilla River has jumped its banks at Riverfront Park causing water to flood much of the park. The Hermiston Parks and Recreation Department has closed the parking lot and portions of the park until the water recedes. Citizens are urged to use caution if they are in the area. According to the parks department, Riverfront Park and Oxbow Trail were designed to accept flood water on accession. This is why homes are not allowed to be constructed in flood zones and why parks and open spaces are ideal. Although it is a bit of an inconvenience for a few days every few years or so, Riverfront Park was designed with periodic flooding in mind. In 2014, heavy rains caused the river to overflow into the park as well.